Bees are invaluable members of the ecosystem. The sustainability of many of the foods we eat is directly dependent upon the pollination provided by these incredibly productive insects. The prospect of being stung by a bumble bee or a European honey bee is quite another story. We avoid being in close proximity to bees and hives because of this very concern. Some people are understandably fearful of the pain associated with stings. 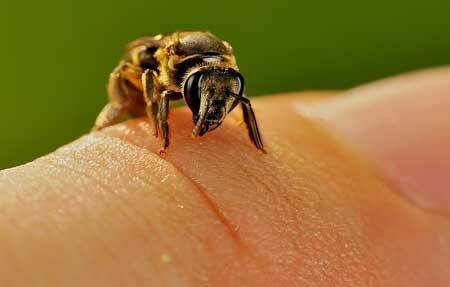 A much smaller segment of the population has yet another reason to fret: allergic reactions to bee venom. There are however certain individuals who seek out bees for the express purpose of getting stung repeatedly. The bee therapy group (78 participants in all) reported 49 cured patients, 27 improvements and 2 “ineffective” results. This is a “cured rate” of 63%. Just look at ACE inhibitors- made from snake venom. Also, about the bee, what about Homeopathic APIS, aka the honeybee? Wow… I never would have thought…. Venom is indeed a topic of great interest with regard to drug development. Certain components of bee venom (such as melittin) are even being investigated for their chemoprotective effects and beyond! Wild and wonderful! I have an aunt whom had a stroke and her whole left side muscles are paralyzed and she is constantly in bed, she can not move left arm and left leg. Venom therapy may give her her active back. Please someone contact me help me get her life back. She needs bee venom therapy someone please help. Perhaps they can assist you to find a reputable apitherapist in your area.